I love surrealistic art and consider Salvadore Dali, Max Ernst, and M.C.Escher among my favorite artists. I like to think of these pieces as surrealistic designs. I committed a great deal of time in the planning and designing each one before executing them. 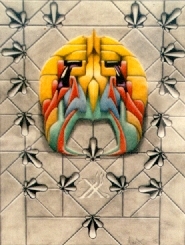 All three of the "Dreaming Masks" were completed as a set but only #3 is in a private collection.